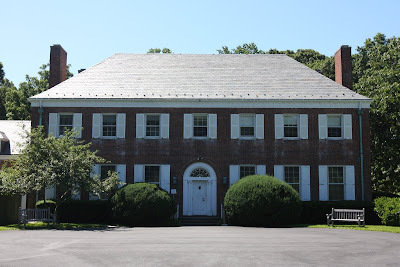 'Old Orchard', the residence of Theodore Roosevelt Jr., designed by William McMillan in Cove Neck c. 1938. 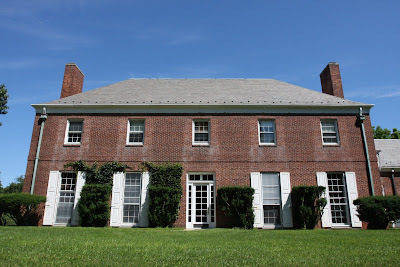 Roosevelt had wanted to reside in his father's 'Sagamore Hill' next door but his mother instead gave him a few acres of land behind the house to build his own. Ted Jr. won a Distinguished Service Cross in World War 1 where he served as a Lt. Colonel. Between wars he served as Governor of Puerto Rico and Governor-General of the Philippines. By 1942 he was a Brigadier General and landed at Oran, Algeria in Operation Torch in November 1942 during the invasion of North Africa. After petitioning for inclusion in the D-Day landings at Normandy in June 1944 he became the oldest man in the invasion and the only General to land in the first attack wave (where he landed off his mark at Utah Beach). Though he died the following month of a heart attack while still in France he was posthumously awarded the Medal of Honor for his actions on Utah Beach and is buried alongside his brother (who died in WWI) in Normandy. Click HERE to see 'Old Orchard' on google earth. 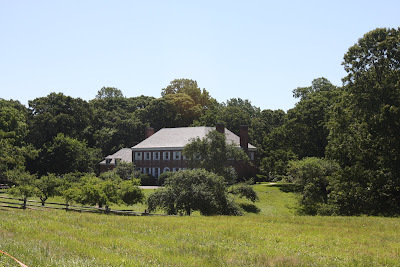 Curious that he wanted to live in a wonderful piece of Victorian oompah like Sagamore Hill but built a restrained, deliberately spare house like Old Orchard!